Frida Festival 2019 – Viva Frida! The Frida Festival is entering its 14th year and originated in Houston – 2020 will be our quinceañera. The Frida festival will take place at Discovery Green on April 6 & 7th. It will feature local musicians and performers, along with a market with a wide range of merchants and food vendors, and a sculpture garden. And we will have our famous Frida look alike gathering for all ages. We will also produce a satellite art exhibition at Hardy & Nance Studios at 902 Hardy St, Houston, TX 77020 on April 5th. Since 2005, Frida Festival has been produced by Houston artist Lizbeth Ortiz with Houston Institute for Culture (HIFC) joining in 2010. HIFC is a 501(c)(3) non-profit. This year the festival will be produced by HIFC Board members, volunteers and artists. Merchandise vendors can submit their information here. Food and drink vendors can submit their information here. Artists interested in participating in the show at Hardy & Nance Studios can submit their work here. All work must be original creations of the artist submitting the application. No reproductions of original work by other artists or Frida Kahlo’s original pieces will be accepted. 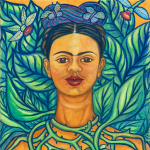 We are looking for original pieces that incorporate Frida’s legacy and or inspiration. All mediums are welcome, work must be reviewed an accepted by the curator. We need your help to keep this festival growing and free – we are accepting donations here through March. Contact us if you’d like to be a sponsor, vendor, or volunteer, or have other questions about Frida Festival. Sign up for our mailing list for news about Frida Festival and our parent non-profit.